Here is my creation playing with Plaid or Checks. I love this Gingham Gala Designer Series Paper Stack. The colors are beautiful and one side is large checks and the other is small. 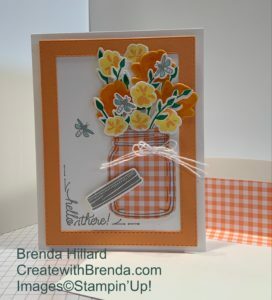 I also used the Jars of Love stamp set that coordinates with the Everyday Jars Framelits. A Big Shot and dies make creating so easy… I hope you like my interpretation for the PP436 challenge. Please comment, I love hearing from you! Here are the products I used to create this project. If you would like to order any or all of these products, just click on the product to be directed to my online store. Are you looking to De-clutter and get ORGANIZED? Storage by Stampin’ Up! will be featured in the 2019–2020 annual catalog. *Inventory Disclaimer: Because Storage by Stampin’ Up! 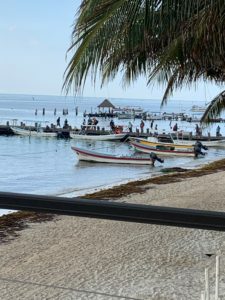 is a brand-new product line, our inventory levels for this initial launch are based on research of similar products and their existing demand. If our inventory of Storage by Stampin’ Up! products is depleted, we will turn items off until their inventories have been replenished. Keeps products organized, tidy, visible, and trackable at all times. Ensures that your Stampin’ Pads, Stampin’ Write Markers, and Stampin’ Blends are all stored horizontally, as recommended. Designed to be stylish, durable, compact, stackable, and modular. Blends in naturally with most home decor with its white neutral color. Stacks vertically and can be arranged to fit practically any flat workspace. Easily assembled and disassembled for rearrangement and/or cleaning. Click HERE to calculate your layout. Click HERE for pricing and HERE to place your order. 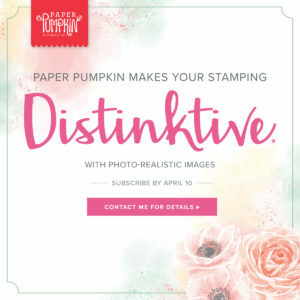 Paper Pumpkin likes to surprise you with innovative kit products every month, and in April, we have something fun and new: an exclusive stamp set that includes Distinktive® images! The Distinktive stamped images are photo-realistic, crisp, and clear. We’re sure they’ll leave an “impression” on you! Subscribe or Reactivate by April 10th to get this Distinktive kit! You can get your NEW subscription or REACTIVATE by clicking HERE. I also host a Paper Pumpkin on the Porch Party the first Saturday of every month for all of my subscribers. Lots of FUN, new FRIENDS and FABULOUS creativity! Let me know if you would like to join us. I hope you had a great week. 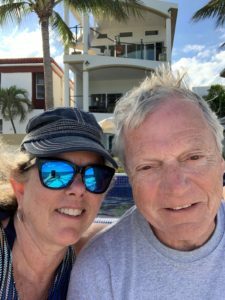 Lots has happened at Stampin’Up! We are in the Final month of Sale-a-bration already! and a 3rd release of FREE items to choose from with a $50 product order has been released. HERE is what has been added. It is also Paper Players Sunday and that means a new challenge. This week it is SPRING FEVER! 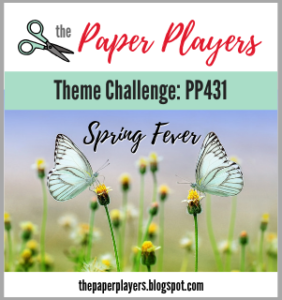 PP43 and who doesn’t have “spring fever” right now? Here is my submission for the challenge. I really love playing along with these weekly challenges as it gets me thinking outside of my usual. You should try it with me! 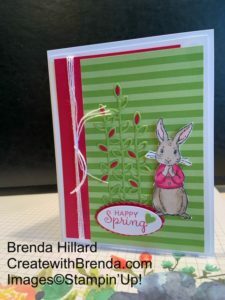 I am also starting something new at my Create with Brenda Design Team page on Facebook. At the end of March, the 31st to be exact, I will be giving away 1 Forever Lovely Bundle, that’s right, the stamp set and framelits to 1 lucky winner. How do you get in the drawing you ask? 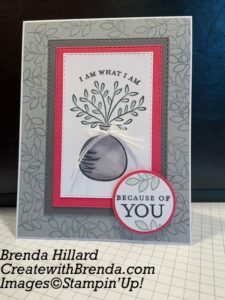 You must post a stamped creation to my Facebook page CreatewithBrenda. Just ask to join if you are not already. 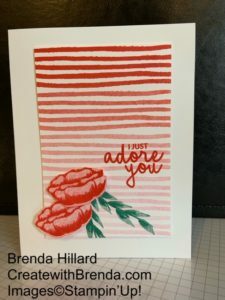 It can be any name brand stamp, does not have to be Stampin’Up! Post your creation on my page with #March2019 and your in! I know there was a lot of new product purchased last month, so let’s see what your doing! 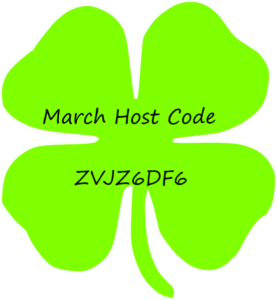 If you are ordering online, and your order is under $99, please use the March Host Code below. Get Your CREATE on at the Winery! Seeing how it is Sunday, there is another Paper Players Challenge PP430. This week it is a sketch challenge, meaning that they give you the layout and you create the card. Here is this weeks sketch. And here is my interpretation of the sketch. 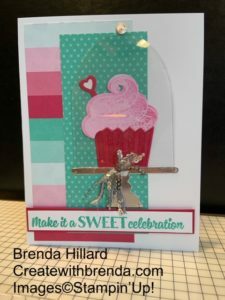 I loved using the dies that coordinate with the Sale-a-bration “Hello Cupcake” stamp set. The Sale-a-bration Coordination release starts Friday March 1st. See all the other great products used in this project below. You can just click on the products to go to my online store! That’s a wrap for today, I hope you enJOY your day! Happy 6th Birthday Paper Pumpkin! Because Paper Pumpkin is turning 6, Stampin’Up! decided to create a kit that is perfect for making birthday cards! •This kit has an element that is sure to “pop”! •The FREE stamp set is even bigger and better than your typical Paper Pumpkin stamp set and can be used on a variety of crafting projects. It was so fun participating in the Paper Players Challenge last week, I thought I would give it another go! This week the challenge is a Clean-and-Simple Challenge from LeAnne PP429. The guidelines are monochromatic (shades of the same color), minimal layers and embellishments, plenty of open space (white space), simple and uncluttered. Here are the cards I created this morning. I would love for you to leave a comment on which card you like best and why. I have listed products used below each card. If there is something you would like to order, click HERE and use February’s HOST CODE YER69B3T to receive your ordering gift from me! 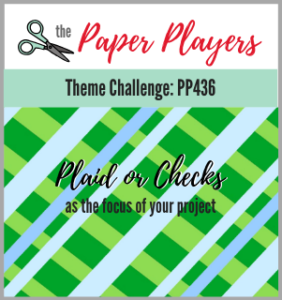 Giving the Paper Players Color Challenge a whirl this week! 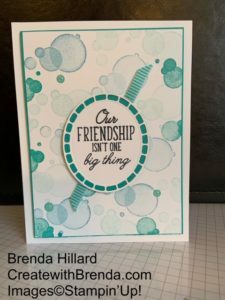 Welcome to Create with Brenda! I hope you are having a great day. I am giving a color challenge a try today! I have never done this before, so I hope I get all the links right 🙂 I am submitting this entry for the Paper Players Color Challenge PP428. The challenge is to create something using Basic Gray, Melon Mambo and Smokey Slate. Here is my submission. What do you think? I would love to get your feedback. Available to my first 5 customers! Starting February 1-28th, I will be offering a Big Shot special. Here’s the deal, purchase a bundle from me, either online or workshop order, with a value of $40 dollars or more and I will sell you a Big Shot for just $79! *you will purchase the Big Shot from me personally. Here is a look at the available “bundles” from the Occasions catalog. Remember the bundle must be over $40. Please note you may order from the Annual Catalog as well. Don’t miss out on the Sale-a-Bration Foil Sheets! With a qualifying purchase of just $50 you can get the Grapefruit Grove and Lovely Lipstick Foil Sheets, 8 sheets total, 4 of each color! Supply is running low, so if you’ve been thinking about it, now is the time to move! Enjoy the video below to see just how beautiful they are.